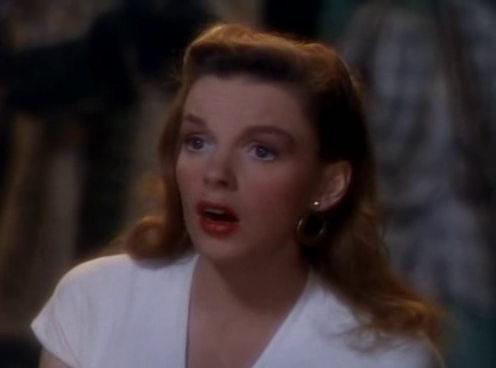 On a 19th century Caribbean isle, a young woman (Judy Garland) engaged to her town’s pompous mayor (Walter Slezak) is wooed by a travelling troubadour (Gene Kelly), who pretends to be the mysterious pirate Macoco in order to impress her. Vincente Minnelli’s third and final film with his wife (Garland) in a leading role — after Meet Me in St. Louis (1944) and The Clock (1945) — was this critically panned musical-fantasy, which has since gained a renewed reputation as a cult favorite (though it’s not labeled as such in the back of Peary’s book; perhaps this status has emerged in recent years). Both Garland and Kelly are in peak form, and appear to be having a blast; they seem to realize that the story is purely escapist fare, and (thankfully) never take it too seriously. Garland’s finest moment comes early on, as she breaks free from her character’s prim persona, and — under the influence of hypnosis — dazzles Kelly and everyone around her by breaking into a lustful ditty about her crush on “Mack the Black” (who, according to the song’s lyrics, “leads a flaming trail of masculinity” ! ); the pure contrast between this and what we’ve seen before, with Garland’s Manuela meekly agreeing to marry a portly man much older than herself, is remarkably effective. Kelly, meanwhile, exhibits seemingly unflagging energy throughout. He’s given the opportunity to shine during two wonderful dance sequences: early on, during the song “Nina”, as he makes it known that he’ll fall for any beautiful woman he sees (though naturally, once he lays eyes on Manuela, his womanizing days are over); then later, during a daydream envisioned by Manuela, as he shows off his remarkably muscular physique while dancing the stunning “Pirate Ballet” (see still below). Walter Slezak is well-cast as his nemesis (and the film’s all-around baddie); to that end, the mistaken identity plot is nicely handled, and allows for some fine tension during the denouement. 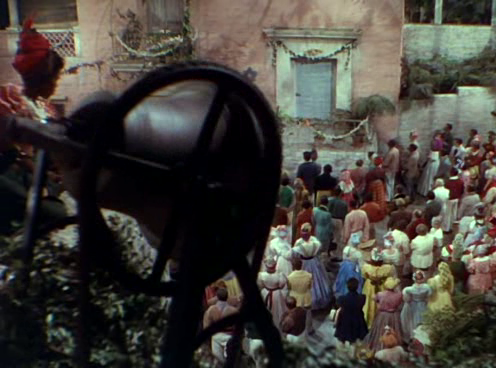 The vibrant sets and Technicolor cinematography are also worth a mention. 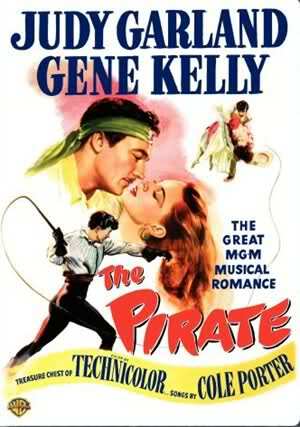 While not one of Garland’s (or Minnelli’s) best musicals, The Pirate is enjoyable while it lasts, and should be seen by all film fanatics at least once, simply for its cult status. Yes, as a recent cult favorite. An absolute must – as an immensely entertaining classic bizarrely under-appreciated. Obviously, my enthusiasm here is strong. Which may be surprising considering Minnelli is not among my favorite directors. Generally speaking, visually he tends to always come up to the plate, but I often find his work wanting in terms of storytelling – i.e., his tendency toward being overly sentimental. Minnelli seems to do well when he can simply trust general-audience material and serve it up with panache. Which is the case here. It’s mind-boggling that ‘The Pirate’ was not well received upon release. It clearly has everybody before and behind the camera in top form, and all it sets out to do is tell a rousing musical tale with sophistication and taste. Where’s the problem? The film is blessed with a very rich, intelligent script by pros Albert Hackett and Frances Goodrich (from the S.N. Behrman play). It builds wonderfully and has surprising turns in store. There are also delightful Cole Porter songs. The pacing is precise: high-energy when it needs to be; otherwise, smartly controlled. I’m less impressed with Kelly this time out. As always, his dancing is superb. But, for most of the film, he plays the kind of slick-talker that he can play in his sleep – and that’s a little tired and forced. 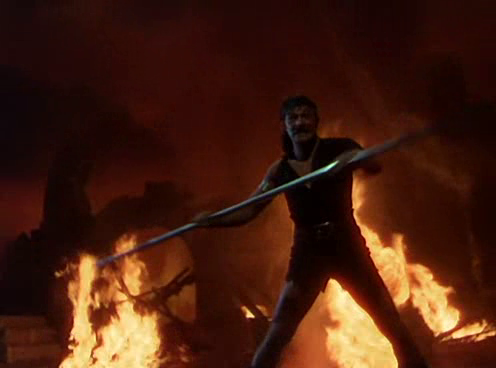 (It comes off as sharp contrast to what Garland is aiming for.) Along those lines, there’s an interesting scene (ultimately reminiscent of something out of ‘Taming of the Shrew’) in which Garland has particular fun making mock of Kelly’s character’s acting ability. Don’t get me wrong – Kelly is basically fine. But Garland owns the film. I particularly like the way the film concludes. It’s very well written, is very satisfying – and the segue into ‘Be A Clown’ is first-rate. It must be noted that there is something very…gay…about ‘The Pirate’. Not just witty and pleasant, but gay in tone. Nothing overt – but with Cole Porter and Minnelli at the forefront, something is afoot that is a touch more than merely whimsical.